There are probably few topics in philately that are of greater consequence and that involve more misunderstanding among collections and dealers alike than catalogue values. It has been my experience over the past 37 years that most collectors have a wholly unrealistic idea of the relationship between catalogue values and market values, and what they should expect to pay for the stamps in their collection. This lack of realism exists on both sides of the spectrum: collectors who think that their stamps are worth way more than they actually are, and those who think that stamps that are actually scarce and expensive should be way cheaper. One of the most widely held, and in my opinion mistaken beliefs about the relationship between market value and catalogue value is that market value is always a more or less fixed percentage of the catalogue value. You can often hear collectors say:"I never pay more than 1/3 of Gibbons", "Gibbons is way overpriced" or " I never pay more than 75% of Scott". Such collectors may indeed be speaking the truth, but that doesn't mean that those collectors are amassing complete collections of scarce and desirable material. Indeed those collectors could be collecting run-of-the-mill material that they are buying in bulk at auction, in which case they are paying the right price. So in this post, I want to offer my insights about catalogue and market values that I have gleaned from 37 years of personal experience and 10 years of professional experience spent working in the trade. 1. It will not be overly complicated. It will refrain from listing items that require an extensive amount of experience to identify correctly. 2. It will price material in the quality that is good enough to satisfy most collectors and is readily available in the marketplace. It will include prices for above average, but but not perfect material. 3. Where several different varieties of a stamp exist, unless the catalogue is listing the varieties separately, it is pricing the most common variety of that stamp. 3. Because dealers have to make a living and have overheads to cover, it will usually value stamps at a minimum of 20 cents or more per stamp. Thus a general catalogue is not really geared towards the valuation of highly specialized collections, where the scarcer varieties of a common stamp can be worth many hundreds or thousands of dollars. It is also not geared towards pricing exceptional quality. If any of you have followed the US stamp market during the past 20 years, you will no doubt have witnessed the huge difference that exceptional quality makes to stamp values. There are a lot of collectors and dealers who consider this to be some kind of gimmick or fad. But I would beg to differ. I think that what is happening is that collectors are becoming more informed and sophisticated and are beginning to recognize that truly superb examples of just about any stamp are scarce, and demand is pushing prices up - way up. The first misconception often held by non-collectors who inherit stamp collections, but also sometimes by collectors is that valuing their collections is just a matter of getting a catalogue and adding up the values. Many sellers are often shocked when a dealer offers them just $20-$100 for their grandfather's stamp album and they feel cheated and have a bad taste in their mouths. Run-of-the-mill used material from 1890-1990 that is not present in quantity, is not specialized, and catalogues less than $2 per stamp has little to no commercial value on a per stamp basis. Such collections generally fall into the category above. 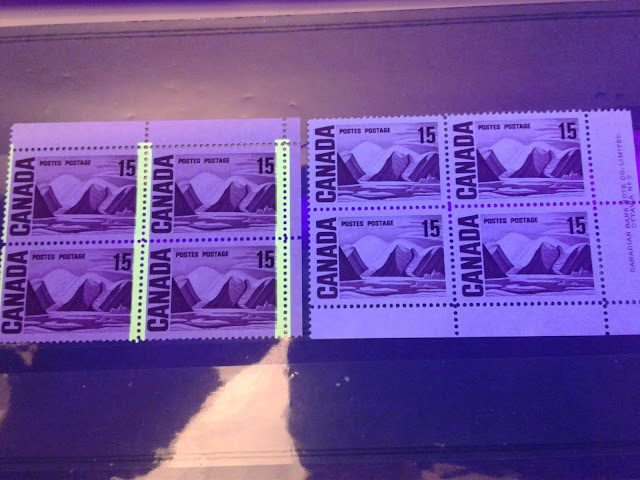 The reason why they have no commercial value is that the stamps are common and are not salable to a specialist because there isn't any depth of quantity. A world album with 100 stamps from most every country is so labour intensive for a dealer to break down, sort and re-price that it will never be worth more than $20-$100 to them. This stamp is #F1, It is the first registered stamp of Canada and has a catalogue value of $3 for fine and $9 for very fine in the Canadian Unitrade catalogue. It is a common stamp, but not nearly as common as the 1c, 2c or 3c Small Queens of the time. If you went to a dealer with a collection of 1,000 used F1's sorted by shade, paper, perforation, cancel etc., you would definitely receive an offer that was a percentage of the catalogue value, although it would still be low unless the stamps were of exceptional quality. If you had 1,000 fine F1's you wouldn't receive anywhere near $3,000, but more like $500-$600. Still way, way more than the fellow with the world album, and that is at the $3 catalogue mark. This stamp is Canada #41 and is probably one of the most common stamps of its time. It catalogues $1 for very fine used and $0.30 for fine in the Canadian Unitrade Catalogue. Although is is very common in fine or below fine condition, it is not common in grades higher than very fine as shown above. If you had a collection of 1,000 #41's that looked like the stamp above, it is quite likely that you may receive more than $1,000 at auction. A dealer won't offer you more than $500-$600 as in the example above, but you may net more than full catalogue at auction. Why? Two reasons. First is the scarcity of the condition. Even though the catalogue's top graded price is $1, that is not the true value of a stamp in the Extremely Fine or Superb grades. Such stamps may retail for as much as $5-$10 each because of their scarcity. The second reason is that the catalogue value does not take the scarcity of specialized paper varieties, plate flaws, rare shades and cancellations into account, and a collection of 1,000 examples would probably have some of these. However, if the above stamp were fine or below then 1,000 examples would not be worth anywhere close to $300. $20-$40 would be closer to the mark - much the same as the fellow with the world album. 1. Any specialized holding of better quality classic stamps issued between 1840 and about 1930. 2. Modern mid to high value used commemoratives with nice circular date cancels issued since 1990, as this material is getting hard to come by. Low value commemoratives, Christmas and definitives are still very common, and don't really have any commercial value. In-depth cancel collections of commemoratives issued before 1990 would also be an exception, but only if there is enough depth to interest a specialist. This stamp is #36, the 2c Small Queen. It is just as common as the 3c stamp above. It catalogues $1 in fine condition and $3 for very fine in the Canadian Unitrade catalogue. The quality of the above example is average and of no real commercial value. 1,000 of the above stamp would not be worth anywhere close to $1,000 unless there were some rare cancels or some perf. 11.5 x 12's included. The real value of a holding like that would be around $75-100 to a dealer. To a collector, maybe $150-$200, but not much more. Once you move above the $2-3 catalogue mark, a collection takes on a value that is a function of the total catalogue of its component stamps. The less labour and time that a dealer has to expend to market and sell it, the larger the percentage that he or she can offer for it. Many catalogue users assume that where there are several priced grades for stamps and covers, that the highest priced grade is essentially perfection. They then demand steep discounts from the catalogue price when the material is not perfect. Such collectors often have a strained relationship with many stamp dealers and are often unsuccessful at auctions when they bid. All general catalogues include an introduction that defines the basis of their pricing (i.e. what grade they are pricing) and then they go on to define the grades. The Stanley Gibbons Commonwealth and British Empire Stamps 1840-1940 catalogue devotes no fewer than 7 pages to explaining what they consider to be "fine" for each and every possible condition attribute. They clearly state that their prices are for fine and that the grade is an average of the grade of all condition factors. Thus just because a superb stamp has a short perf. does not mean that it is not fine. As far as Gibbons is concerned, if all the condition factors are better than fine, then 1 or 2 small defects will NOT result in the stamp being downgraded from fine. They explain very clearly the circumstances in which they would discount their stamps. The flip side to all this is that all general catalogues are completely silent when it comes to valuing material in high condition grades. By high I mean grades that are very seldom encountered. The reality is that Very Fine is to use a golf analogy, very much like par: it is well above average, but it is not "a hole in one". Why is this? Well the main reason is that it is too difficult to determine the market value of this material reliably. Catalogue values for most stamps are an average of what collectors in the market are willing to pay. A catalogue can list a reasonably accurate price when there is enough of the material being traded in the open market for an average to be computed based on a large number of auction results or individual retail transactions. Because high-grade material is so uncommon, any value would be based on a very limited number of trades, and catalogue publishers are just not comfortable listing a value that is based on such limited data. In addition to this, the market values for this type of material are always increasing, so any published price will be out of date almost as soon as it appears. The moral of this is to read the condition information in the front of the catalogue thoroughly and completely understand the condition grade that is being valued as well as to how to identify it. Don't assume that you should be able to buy a high-grade example of an otherwise common stamp for catalogue price. In most instances, unless we are talking about a modern stamp issued after World War II, you will almost certainly have to pay more, sometimes much more. Many older collectors are of the belief that the values in Stanley Gibbons are highly inflated, and expect to pay 25%-40% of Gibbons for their stamps. Indeed there are many dealers that offer Commonwealth material at this standard percentage. If you look closely though, you begin to notice a pattern: either the material being offered does not consistently meet the Gibbons definition of fine, which is really similar to what we would call very fine in North America, or it is not the scarcer material. It is true that Gibbons does inflate some values. They are regular stamp dealers just like the many thousands in the world. They are not omnipotent and contrary to what a lot of collectors may think, they do not have every stamp listed in their catalogue in stock. I was at their 399 Strand store back in 2010 and I can tell you that they don't have even close to 1/4 to 1/2 of what they list in stock at any given time. The only country that they do consistently have in quantity is Great Britain - specifically used Queen Victoria. They actually make the market in this material. They have massive stocks and they control the release of it, in much the same way that DeBeers controls diamonds. If you look for truly superb used GB, there are only a handful of dealers who can consistently supply it and Gibbons is one. It is scarce, but not nearly as rare as nearly all the material from the Colonies prior to 1960 is. Yet if you look at the catalogue values for used GB in Gibbons they are very high. I specialize in Nigeria and the other British West African countries and I can tell you that if you actually try to accumulate a stock of quality stamps in depth of any issues prior to about 1935, they are all scarce to very rare in fine condition. Gibbons values for this material are definitely either at the mark, or in most cases are too low, and do not adequately reflect the rarity of the material. This makes sense because there are very few large collections of Nigeria bought and sold and very few large selections offered for sale at auction. This is precisely because the material is so scarce. I suspect that this is the case for all the British Colonies. The reason why Commonwealth stamps do not seem rare is that it is such a vast field, that a collection can have a handful of the most common stamps of each colony and still be a large collection. Thus just looking at the number of Commonwealth collections out there will not give you a true indication of scarcity because you wind up comparing apples to oranges. The only way to really tell for sure is to focus on one colony and see how long it takes you to acquire a complete range with a depth of 10-15 of each stamp or set. Then you will see how truly scarce most Commonwealth stamps actually are. Common Misconception #4 - I Should be Able to Buy My Stamps From a Dealer For the Same Price I Would Pay at Auction. I wrote a post some time ago in which I explained what services a good, honest and ethical stamp dealer provides to the hobby and collectors in general. Indeed, it is my belief that it is dealers that provide the underpinning of the philatelic market. Without them, stamp auction firms would be in big trouble, as dealers are usually their most active bidders (at least on their large lots). The main point of this post was to point out that a collector who benefits from the services offered by a retail dealer should be willing to compensate the dealer for them. Those services include making a selection of material available for immediate purchase, taking on the risk associated with mis-identification, standing behind every stamp they sell, even if it means refunding a collector years later, providing liquidity to collectors who need to sell immediately. Part of this compensation comes in the form of higher prices per stamp. If a you can buy a large collection of British Colonies at auction for 35% of catalogue, does it really make sense to expect a dealer to sell you just one stamp for 50% of catalogue? He or she is saving you the trouble of having to buy the entire lot and dispose of what you do not want. Is a 15% markup really fair given everything the dealer has to do to bring that stamp to a state where you can spot it in a stockbook or online and decide that you want it? Think about it. I'm sure you would agree that it isn't enough of a markup to enable a dealer to make a living. I am interested to hear you comments and views on this topic, as I expect that there will be a number of different perspectives out there, not just mine.